Doctor Who: The Moffat Scripts – LAST CHRISTMAS | Warped Factor - Words in the Key of Geek. Dr. Moo believes in Santa. Death in Heaven was a good story, in this reviewer's opinion, but it was also rather depressing. Danny Pink is dead, Gallifrey is still missing and the Doctor & Clara both lie to the other about it before parting ways. That’s where we join the story in Last Christmas, with the Doctor arriving on Clara’s rooftop as the pair of them come face-to-face with Santa Claus. It doesn’t take long for those lies to be addressed and apologies given and that’s a good thing; let’s get on with the story. I can’t say I was looking forward to the presence of Santa and his elves in this episode. On paper this concept reeks of childishness and though it’s a Christmas Special and the expected standards are lowered there’s a line, and including Santa Claus is pushing it. I mean seriously, it’s only been a few months since the Doctor met Robin Hood for crying out loud! It would seem Moffat knows this however because he decides that the ridiculousness of Santa’s presence in the story is actually a key plot point. Plus Nick Frost plays him (and even gets his name into the titles) so I’d be prepared to let anything go to have him in Doctor Who. That’s inspired casting and he brings just the right amount of humour and sarcasm to the part whilst avoiding the obvious trap of ruining children's visions of Santa Claus – in fact he adds to it, throwing in some explanations about how he does what he does: his sleigh is bigger on the inside and his reindeer can fly because he feeds them magic carrots. Sure, why not? 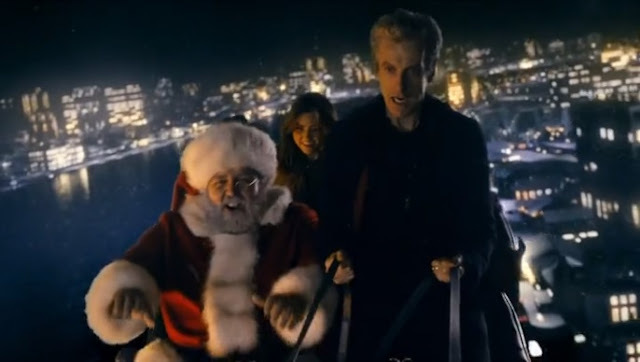 Also the red nose of Rudolph can be activated like a car alarm and at one point the Doctor flies the sleigh over London. It all sounds awfully silly but it works within the story because the ridiculousness of the whole thing is, as I’ve said already, a key plot point. Another reason why this works is because Santa is not the focus of the story but a supporting character (despite Frost’s main title billing). 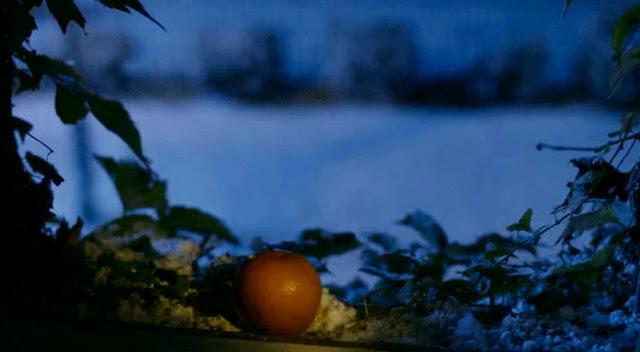 Last Christmas is the kind of Doctor Who story we never should have reasonably expected to see on 25th December, a Troughton-esque base under siege story! The focus is on the Doctor and Clara meeting a crew of scientists at the North Pole where they’re under attack by Dream Crabs and all of them are slowly being killed. These Dream Crabs are another example of Moffat’s signature Mundane-Concept-Made-Scary. This time the idea is that if you even think of them then they’re coming to get you. Have you ever tried not thinking of something? It’s like Time Heist’s Teller was a practice run for this idea, as this story uses the idea much better. Maybe that’s because he adds a whole new dimension to it; you think you’re awake – but are you really? The trip into Clara’s dream world is also an effective setup, one which could’ve been overdone but isn’t. Should it work? Probably not, but it does. Reunited with Danny Pink we get a look at the life she wanted to have with him but after the events of Dark Water/Death in Heaven she can now never have... but not quite. This isn’t the real Danny, this is the Danny of her dreams and when the Doctor comes to join them it’s this Danny, not the Doctor, who she listens to to wake up. The entire dream sequence is effective with the spooky blackboards reading YOU ARE DYING being the highlight. A very dark theme for a Christmas Special – Happy Christmas, kids! Doctor: Make it a good one. – is a particularly heartwarming touch. It goes without saying that both Peter Capaldi and Jenna Coleman are phenomenally good here, in fact I’d say that both of them do some of their best work. The final scenes especially come to mind. The ending, when the Doctor comes to save Clara only to arrive 62 years late and find her as an old woman, is just beautiful in so many ways. Moffat’s writing deliberately parallels similar scenes from The Time of the Doctor but this time it’s Clara who's aged. That the Doctor can’t tell she’s any older is touching – don’t tell me these two don’t love each other because they clearly do - not in that way but it’s still love. That’s what makes this TARDIS team such an endearing pair and one of the best there’s ever been. 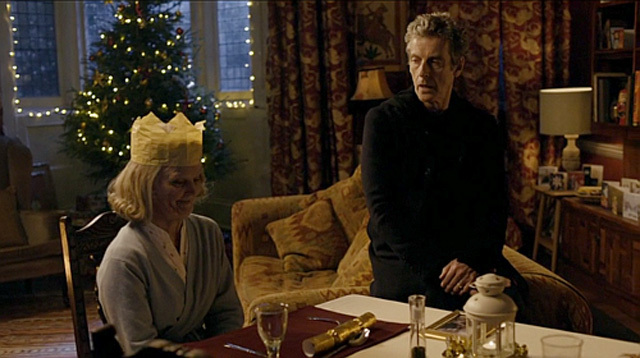 It’s good that Clara doesn’t die here, even if the sudden entry of Santa in the scene feels tacked on in a hasty rewrite when Jenna Coleman decided to return for series nine (and we fans collectively opened a champagne bottle to celebrate this amazing news). So how well does Last Christmas hold up today then? Pretty well I think. Effortlessly combining a base under siege story with all the light fluffiness that comes from being a Christmas Special, and managing to be both philosophical and scary in equal measure. I’d say it makes for a great episode that can be watched over and over without losing its appeal. Moffat tells a deep multi-layered story, with just a hint of Alien and Miracle on 34th Street (that well-known combination), that will keep you guessing until the end. A great way for Doctor Who’s 2014 output to end on a high, I can’t praise it enough. And that final shot with the tangerine and the subtle sound of sleigh-bells to hint that maybe, just maybe, Santa is real? Pure genius!